I haven't purposefully chosen to visit different venues each year, they've just been the ones that have worked out best for me depending on Christmas Day plans. The story behind this year's choice is one that started with the idea to repeat 2013's Great Lines visit with my daughter in her running buggy. This then evolved into going to Barking parkrun so we could have a proper buggy running time trial on their fast, flat tarmac course, but then on Christmas Eve she announced that she didn't want to go buggy running with me. After an hour or so of trying to persuade her otherwise, I gave up and resigned myself to the fact that I'd be running alone. So instead of going further afield, I decided to pick my closest possible venue with the idea being that I could get back home in about 10 minutes once I had finished my run. So on Christmas morning, I crept out of the house while everyone else slept and jumped in the car to Danson Park, in Bexley. I have been to this venue before, so if you want to read about the venue in detail please have a look at my previous Bexley parkrun blog entry. I arrived and parked up at the venue at 8.30am and as it was a little chilly, I decided that I'd have a warm-up run instead of standing around getting cold. 4 kilometres later I arrived at the start line and said hello to a couple of familiar faces. The run started on time and before I knew it I was huffing and puffing around the park as part of a total number of 168 Christmas Day runners at event 149. The one thing that I don't like about Danson Park is the sheer number of dogs the park attracts, and there were plenty of them out in the park again. There were no issues that I know of, but I prefer less doggy places. Two undulating laps later, I arrived at the finish funnel and did all the usual post-parkrun necessities. 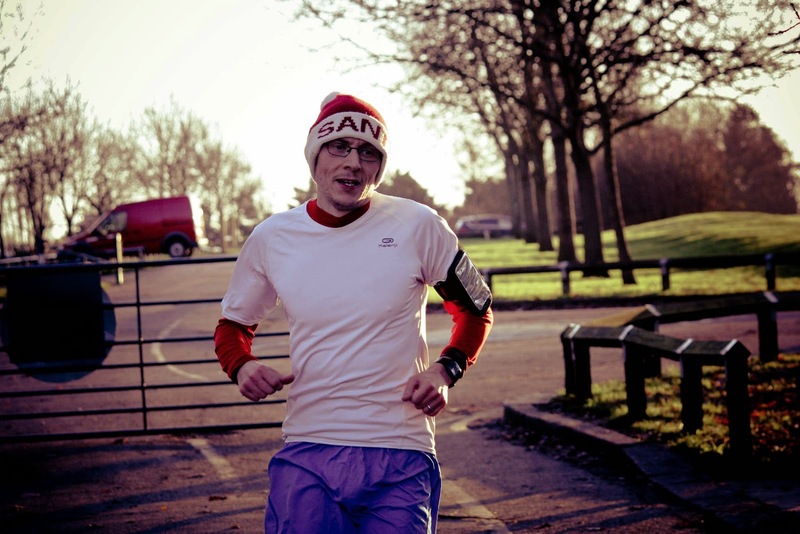 I didn't hang around for long after and started to jog back towards the car, but as I did I bumped into a fellow parkrunner that had been reading the blog, so we had a little chat as we headed towards the gate. We parted company and I continued my cool down jog back to the car. I had managed to squeeze in a nice round 10 kilometres of running first thing on Christmas morning (including a new course pb during the parkrun) and still made it back home before 10am, where I found my daughter still lazing in bed waiting for my return so we could have a family breakfast before sitting down to open a few pressies.